As a stitcher I am very interested in other people’s work. Looking closely to scrutinize, I mean notice, the evenness of the work and any irregularities. Well that being a habit of mine I looked closely at my doctor’s work and noticed that the end of the middle stitch is caught under the stitch next to it, so it is in the cut and my skin is healing over it. I brought that to the attention of the doctor that did the wound check yesterday. He got out that little flashlight they use and said the “Umm” doctors are known for. When I asked is that going to be a problem getting the stitch out, he said yes, and that I should come in twos days early to have the stitches removed. That way it might not be so embedded in the skin. I put a photo of my finger on flickr. I don’t want anyone tag surfing to have it pop up unexpectedly so I won’t post it here. It isn’t that scary really, just some people are more squeamish than others. My finger is healing so nicely and faster than I remember less serious cuts healing. So all in all, stitches were a good choice for this situation. This being a post titled ‘Stitches’; I thought I would post a picture of my favorite crochet stitch for stadium blankets. It is a nice two color stitch for team colors and is heavy enough to either pad a hard bench or keep legs warm during a game. The photo is from a blanket that is almost 8 years old and went through 4 years of high school football games and marching band competitions. Red Heart yarn can’t be beat for durability. 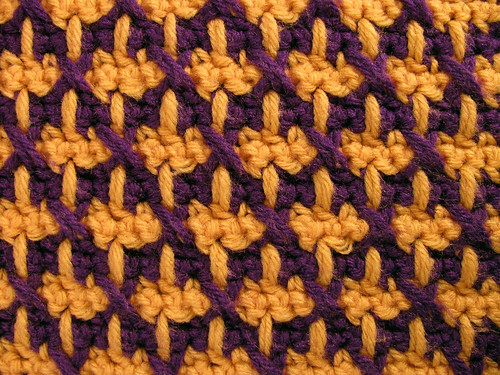 It is crocheted with one of those long stitch techniques where the yarn is pulled though the row two rows down. One color is straight down, and the other color is angled forming an X out of two stitches. Two rows are crocheted with one color at a time, so you are always changing colors on the same side. There is no cutting of the yarn for color changes. I like to crochet a two tone border of one row of single crochet in the lighter color followed by a row of reverse single crochet in the darker color. This entry was posted on Saturday, January 17th, 2009 at 3:00 am and is filed under Crochet and Yarn. Tagged: Crochet, Yarn. You can feed this entry. You can leave a response, or trackback from your own site. Wow! Those stitches do not sound like they were fun! Good thing you were keeping an eye on them!